Noah Tibbetts, 14, of Brewer ties flies at the Annika Rod & Fly booth at the Eastern Maine Sportsmen's Show. Tibbetts sells flies and donates the proceeds to the Children's Miracle Network. Among the regular exhibitors who make a point of spending a weekend at the venerable Eastern Maine Sportsmen’s Show each year, there are more than a few who are a bit newer to the game, and who are worth getting to know. 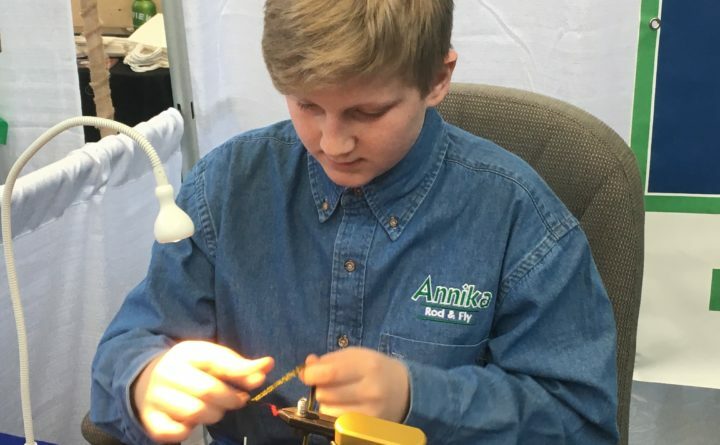 Among those: 14-year-old Noah Tibbetts of Brewer, who joined grizzled vets like Don Corey and Rob Dunnett to do a little fly tying at the Annika Rod & Fly booth. Tibbetts spent time at a vise on both Saturday and Sunday, turning out some classic patterns like the “maple syrup.” On Sunday morning, Dunnett shared a bit of intel: Tibbetts wasn’t your average eighth-grader. He was tying flies for a reason. And he had a story to tell. During those hospitalizations, which have sometimes lasted nearly a month, Tibbetts has learned a lot about the process. Among the lessons: Those stays are tough on the patient and family alike. Especially when he had to travel to Portland or Boston for treatment. That’s why, for the past several years, Tibbetts has been raising money for the Children’s Miracle Network, in hopes of making things easier on patients and their families. In all, he said he has raised more than $40,000 through classroom initiatives and, for the past year, the sales of hand-tied fishing flies. Tibbetts learned to tie from Dunnett, Corey and other Penobscot Fly Fishers members, and Corey said he now considers Tibbetts the fly shop’s latest “pro staff” member. And over the weekend, he churned out fly after fly, using the skills that the veteran tiers have taught him. And you can even do it if you’ve never actually fly fished in your life. That’s right: For now, Tibbetts is a tier — not a fly caster. But he plans on changing that as soon as Mother Nature allows. “I’ve fished with lures and worms for a bunch of years, but I think this year I’ll be using my flies and going fly fishing,” Tibbetts said. If you’re interested in purchasing flies from Noah to help out Children’s Miracle Network, you can send an email to his mom at jtibbetts0926@gmail.com or visit Noah’s Facebook page at facebook.com/noahscreations2.